In its 20th season, is the WNBA where it should be? 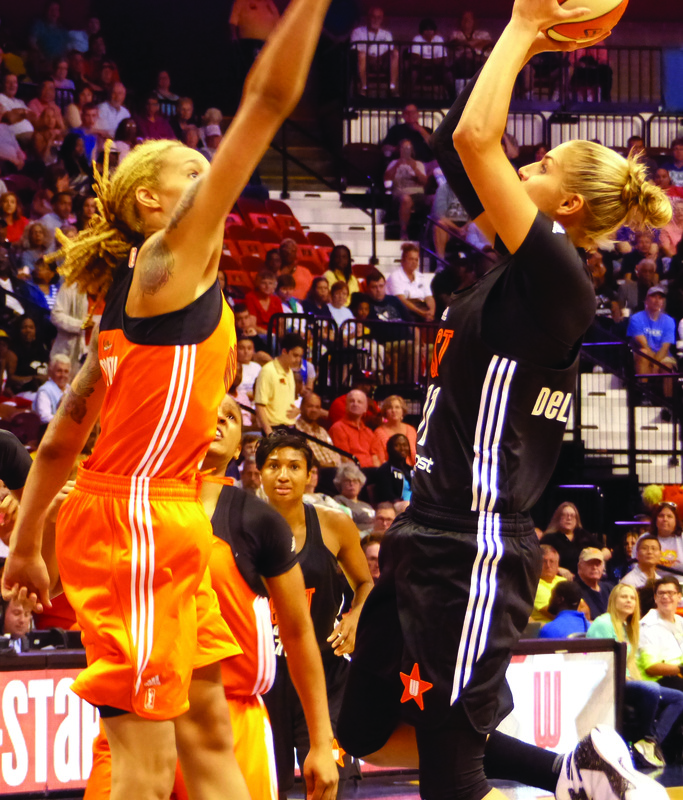 Brittney Griner attempts to block a shot by Elena Delle Donne in the WNBA all-star game last summer. The WNBA will begin its 20th season with lots of fanfare this weekend, and this milestone certainly deserves to be celebrated. But some media outlets will, in all likelihood, devote space to discussions of why more fans don’t support the league. They will dredge up remarks that NBA commissioner Adam Silver made at a Sports Business Journal Game Changer conference last fall. (Silver was quoted saying, “We’re not where we hoped it would be….We thought it would have broken through by now.”) And they’ll point to the fact that WNBA players must play overseas in the winter to make a decent living out of playing basketball. But former WNBA coach and Women’s Basketball Hall of Famer Lin Dunn has pointed out that the WNBA needs to be judged in context. “Compared to the NBA, we are a baby.…I think the WNBA is improving and growing every year,” she said in my 2015 book, Finding a Way to Play: The Pioneering Spirit of Women in Basketball. As recently as two weeks ago, New York Liberty president Isaiah Thomas, an NBA Hall-of-Famer, echoed that sentiment, saying the WNBA is actually positioned well when you compare it to the NBA’s status after 20 years. If you look at NBA history, you’ll find support for Thomas’s remarks. The NBA started its 1949 season with 17 teams, most in cities with major ice hockey arenas, bankrolled in some cases by the NHL hockey owners. By 1954, the league had shrunk to 8 teams and in 1967, the league endured a serious threat from the American Basketball Association, which forced lots of changes that helped the league grow. Still, it wasn’t until Larry Bird and Magic Johnson came along in 1980 (actually 30 years after the league began) that the NBA really took off from coast to coast and became as popular as men’s college basketball. The emergence of Michael Jordan’s Bulls in 1984 solidified the league’s popularity. Women’s professional basketball has endured its own fits and starts and has emerged in 2016 as a league that draws 7,500 fans per game in 12 cities. So the question is: what does “breaking through” really mean? Would the league have to draw what the NBA does (17,800 per game) to be considered a viable entity? Moriah Jefferson, left, and Breanna Stewart, right, will be making their WNBA debuts in May. In another 10 years (when the WNBA is as old as the NBA was in 1980), perhaps this will come to pass. But then again, it may never come to pass for some practical and social reasons. First, the WNBA is a summer league that competes with Major League Baseball for family’s entertainment dollars. As a Connecticut Suns fan who lives 3 hours away from Mohegan Sun, I can’t make it to weeknight games. I can make it to Fenway Park, though. Guess where I spent more time last summer. Another consideration is the fan base. Most WNBA fans are not couch potatoes. They spend their summers playing sports or watching their kids play. They also don’t bet on sports, and frankly, if you eliminated the NBA fans who have a horse at the starting gate when they turn on the TV or go to an NBA game, you might find the viewer and attendance totals more closely aligned. Eliminating all the corporately-owned tickets marked as sold – even though no one uses them – might also level the playing field a bit. And don’t forget the role that the media’s attitude towards women still plays. My book has lots of examples of girls and women’s teams that were hugely popular when the media gave them a chance. Immaculata College in the 1970s is probably the best example. They were the darlings of the East Coast media when they made their Cinderella-like mid-1970s championship runs from their base outside Philadelphia. Going back to the 1950s, the AAU drew big crowds, especially for its national tournaments in the Midwest, and in Iowa, girls basketball games were much more popular than boys games throughout most of the 20th century. One reason was the Des Moines Register’s smart decision to promote tournament time as a way to gain more readers in the small, rural communities beyond the state’s largest city. Today, many local news outlets feature women’s sports events fairly prominently, but national outlets still tend to relegate them to the back pages of their sections (or to a hard-to-find link on their websites). The sad fact is that many sports talk show hosts wouldn’t be caught dead saying something positive about women’s basketball. Even Geno Auriemma’s 11th national championship with UConn this spring, which broke John Wooden’s 10-win streak record at UCLA, was marginalized by some national media outlets. 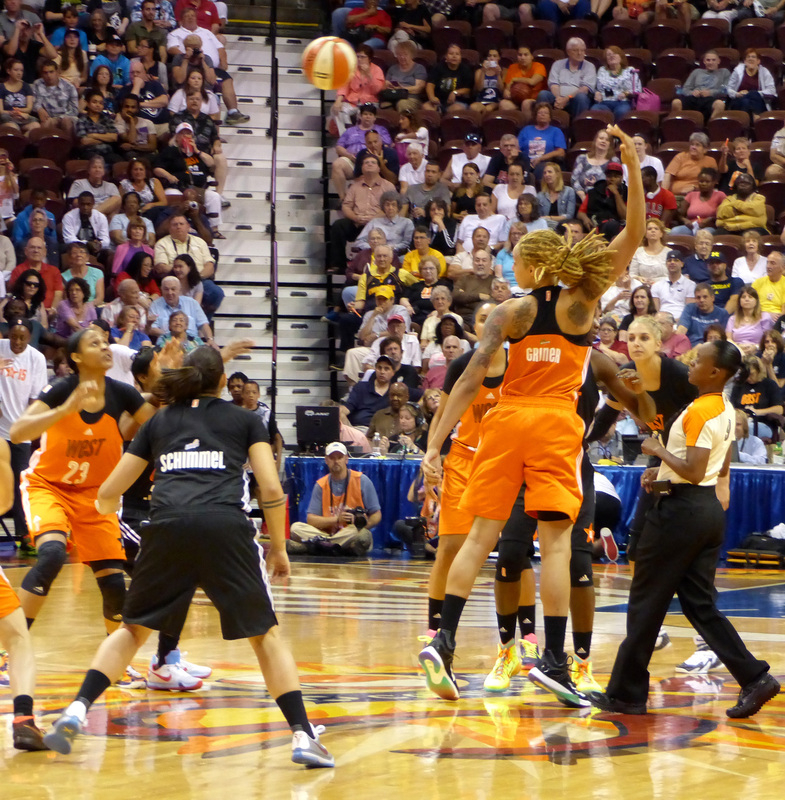 Brittney Griner taps the ball to Maya Moore during the WNBA All Star game last summer at Mohegan Sun. Notice the fans in the stands! Attitudes are beginning to change however. Stars emerging from college basketball, such as Breanna Stewart and Moriah Jefferson, along with established stars such as Brittney Griner, Maya Moore, and Elena Delle Donne, have the kind of celebrity power that can make a difference. So, this summer, women’s basketball fans will be celebrating what is, as opposed to what isn’t. Against long odds, I’d say the WNBA is exactly where it should be – and actually has broken through in a way that many of us could not have imagined 20 years ago. ← What’s going on with all these women’s college coaches?